You don’t have to live with your forehead osteoma. Osteomas are a common and typically benign condition that involves bony knobs or knots along the skull, typically forming in the visible area between the hairline and eyebrows. They can be present at birth or develop suddenly. While osteomas are rarely painful, they can be a significant cosmetic concern, particularly if they are large enough to overshadow and distract from the eyes or other attractive facial features. Fortunately, in the hands of a skilled plastic surgeon, osteoma removal is a straightforward, painless and highly effective face & neck procedure. Most osteomas only involve the outer portion of the skull, which means that the surgical removal can be less invasive. A CT scan may be suggested to confirm that the bony lesion doesn’t extend deeper. 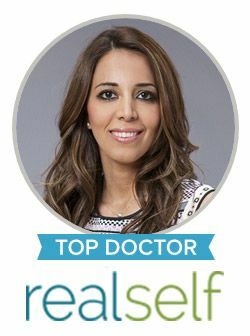 When it comes to removing your forehead osteoma, you can trust Dr. Harirchian to use unrivaled precision and strategic techniques that will minimize or eliminate visible scarring and allow you to regain a more confident appearance. Not only is osteoma removal a brief, in-office procedure, but Dr. Harirchian is able to perform it using an endoscopic approach. The path of incisions is based on the specific location of the osteoma. However, most forehead osteoma removals involve button hole incisions that are well hidden along the hairline or scalp. Patients may even choose light anesthesia for this procedure and recovery is typically minor. Dr. Harirchian has a keen understanding of how different facial features contribute to your overall appearance. When it comes to the forehead, she combines her talent and skill to carefully remove your unsightly bony lesion so that your forehead and brow area can be restored to its most natural and desirable aesthetics. To learn more about osteoma removal in Houston, please contact the office of Sanaz Harirchian, MD today.